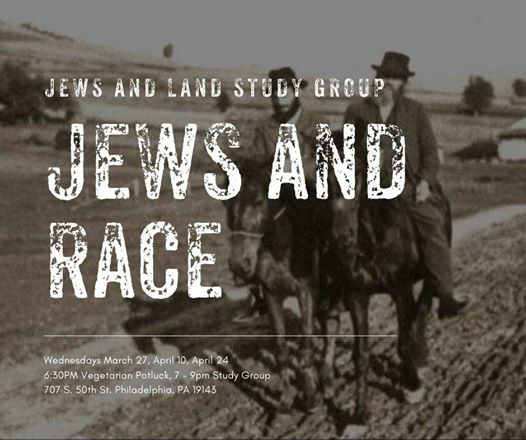 The Jews and Land study group is a five-part bi-weekly gathering to explore a people’s-level history of Jews in relationship to land–from the creation myths of the Torah to the times of sovereignty in ancient Israel, from the diasporas to immigrant farmers in the US. Together we’ll explore books, articles, and other resources on these topics. We’ll learn how we can engage with historical and religious texts in a participatory way, uncovering what stories lie at the grassroots of the past and the truths that endure today. And each gathering will begin with a vegetarian potluck! As a study group, we will all be participating in the learning and facilitation, and everyone will get an opportunity to shape our discussions through engaging in a popular education model of collective learning. Our hope is to share the knowledge we individually bring to the group, expand into places of interest and mystery, and uncover a level of history that does justice to people who have lived before, who live now, and who will be here when we become the history. This is the year’s first set of 5 sessions. In this spring season, we’ll be exploring the relationship between Jews and race in the context of Philly. We’ll look at the formation and flows of the Jewish community–how and where we ended up here–and what that had/has to do with colonization, segregation, and assimilation. We’ll encounter the bumps and bruises we’ve inflicted on our relationships with other minority communities, and seek to learn from them and grow towards solidarity and healing.